The best association for not-for-profit providers. We are the association of not-for-profit long term care, seniors’ housing and services for seniors in Ontario. 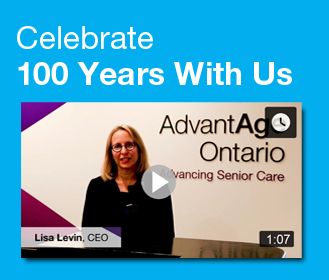 For 100 years, we have been influential in advocating government policies for senior care, dynamic in building strong community relationships, and rigorous in our business practices and accountability. With a focus on advocacy and education, AdvantAge Ontario works on behalf of our members to help all stakeholders understand what the not-for-profit approach means and what it can do for the future of senior care. AdvantAge Ontario is well recognized as the champion of not-for-profit long term care, seniors’ community services and housing. We facilitate the coming together of organizations that are committed to providing high quality care, services and accommodation for seniors in Ontario. Members rely on us to represent and communicate their needs and interests to government, to help them interpret relevant legislation, to work with them to increase public awareness of the value of not-for-profit delivery, and to use our collective expertise to influence public policy. Most importantly, they rely on us to work with funders and other provider and consumer groups to ensure that services for seniors are effective, resident-centred and quality driven. Through our newsletters, member updates and alerts, we ensure a regular flow of information on current and emerging issues and developments that impact on the work of members. A secure, member-only professional networking forum for members to connect, collaborate and share with one another on areas of common interest. Members-only access to this unique, searchable electronic policy management system that has over 1,000 sample policies and resources for long term care and housing. Includes crosswalk links to the LTCHA, its regulations and inspection protocols to respond to compliance requirements. The AdvantAge Ontario Benchmarking Service is the largest and most detailed inventory of financial data from the not-for-profit long term care sector in Ontario. Participating members receive personalized comparative reports and access to customized reports. Get involved in the work of the Association and share your expertise through active participation on advisory groups and task forces. Over 2,000 members attend our highly successful seminars, workshops, and Convention each year. Our well-rounded program provides professional training, growth, and career development. Membership in AdvantAge Ontario gives you a business advantage. Using our collective buying power we have negotiated discount pricing and preferred service arrangements on the products and services that members use most. The AdvantAge Ontario Administrator Leadership Program offers a six-day intensive learning opportunity focused on the core competencies for long term care home administrators. This program meets the requirement for administrators of 100 hours of instruction time in long term care home administration/management under the Long-Term Care Homes Act, 2007*. Receive a free copy of our annual Membership Directory which will be invaluable to you as a networking resource and reference tool. Other Services include our annual awards program, which recognizes member achievements, and our weekly media clips service, which lists sector-related articles and news. The membership fee is a mill rate calculation based on your organization's annual operating expenditure. Fees are calculated based on the program that has the largest operating expenditure. Any other non-profit seniors’ programs that you operate (e.g., housing, day programs, community services) receive free membership. Join AdvantAge Ontario now by completing the preliminary online application form or by contacting Chris Noone, Manager, Communications and Member Services.